Lady Amelie Sherbrooke is not wanted. In fact, her future mama-in-law has refused to share a house with her. But Amelie, thoroughly enjoying her long-time role as hostess for her father, the Duke of Wentworth, has already rejected a score of suitors. With time running out, clearly a love match is out of the question. But desperation makes for odd unions . . .
After six years of war, Marcus Trevor, colonel of the Royal 10th Hussars, has had enough. He buys a hops farm in Kent and retires to the supposed peace and quiet of farming, taking his daughter and a number of his officers and men with him. Alas, the solid citizens of Kent look upon the newcomers not as heroes of the war against Bonaparte but as invaders little better than the French. To complicate matters further, the daughter of a duke needs to be rescued from the man her father insists she wed. What is a poor man to do when his new world refuses to be the peaceful sanctuary he'd hoped for? 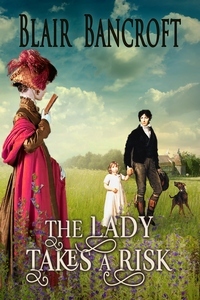 Author's Note: To borrow a word from the 21st century, THE LADY TAKES A RISK is a "Dramedy"-a mix of drama and comedy. Although it is Book 5 in the Regency Warrior series, the story stands alone, with only passing appearances by familiar characters from the past.